Moving on to this week’s post, our last visit to the Bandipur national park has been one of our most memorable ones till date. 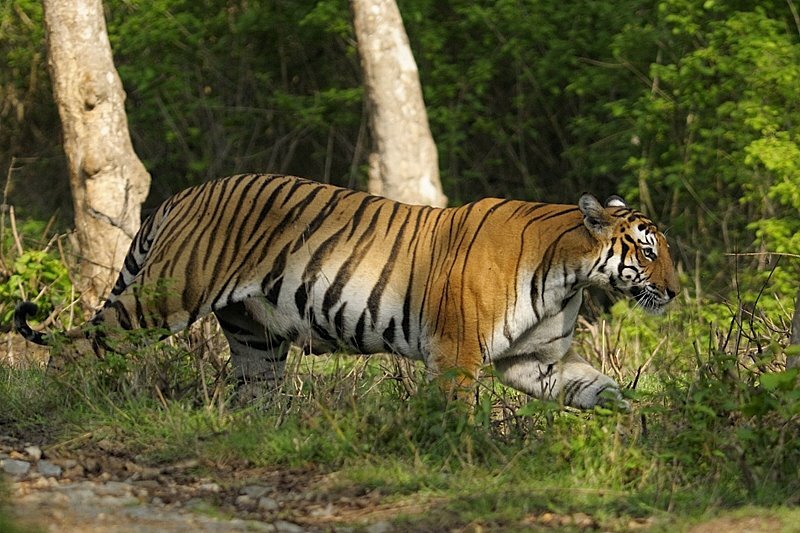 We could not have asked for more – one evening safari we came face to face with a huge Bengal Tiger. And the very next morning we witnessed a spectacular wildlife moment – the Leopard verus Dhole (Indian Wild Dog) confrontation. But that was not all. Lady luck was smiling on us and there was more in store. After witnessing the Leopard Vs Dhole confrontation, we decided to go to the location where we had spotted the majestic Tiger the previous evening – just in case he was still around. When we reached the spot, we slowed the Jeep to a crawl and peered into the thick lantana hoping to sight him. We were still holding our breath and keeping our fingers crossed, when suddenly Saru spotted some movement inside the lantana. Our excitement knew no bounds and with bated breath we looked closely – yes, it was another Tiger! And as we continued looking, what do we see – a tiny cub bounding up playfully. 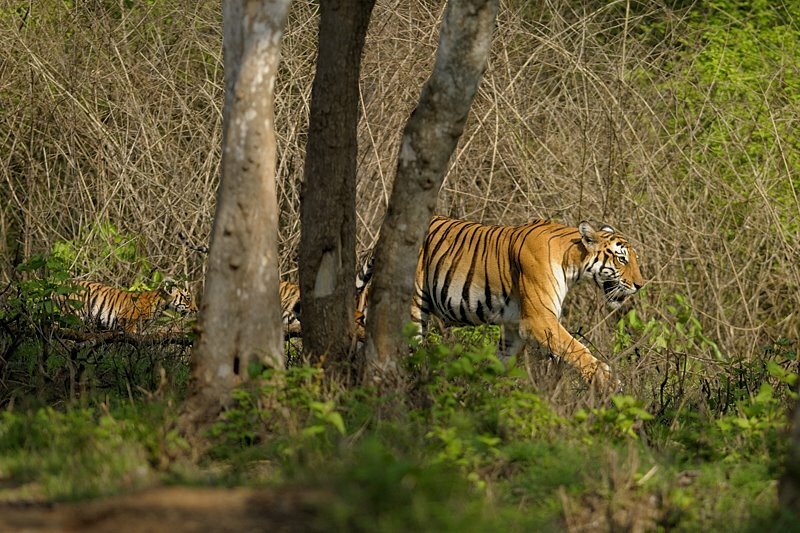 Thats when we realised that it was not the same Tiger as the previous evening, but a Tigress with her cubs. 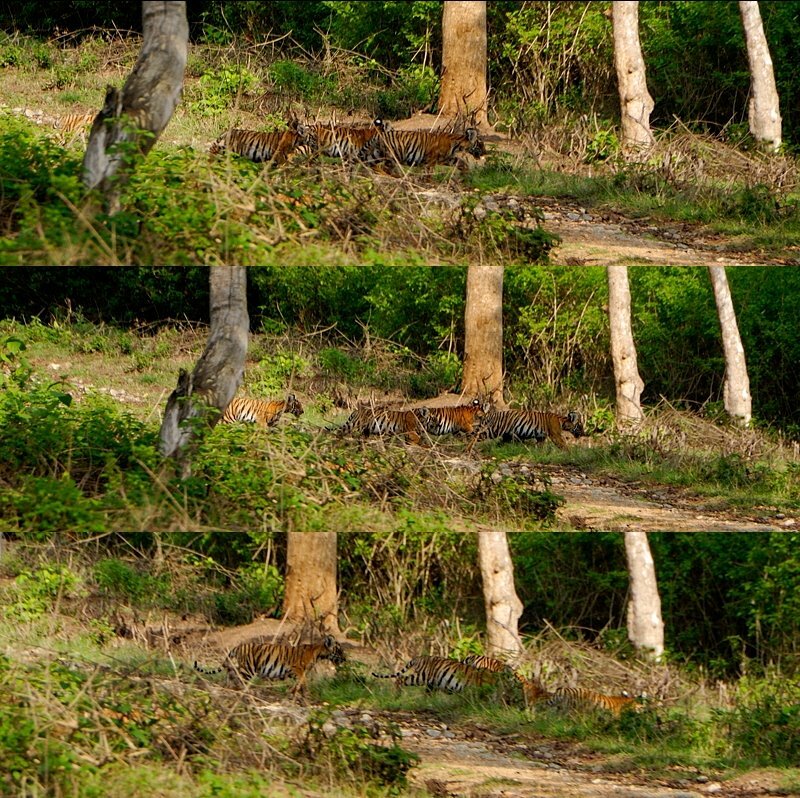 This was sheer luck, as seeing a Tiger cub in the wild is almost next to impossible.As we watched the wildlife moment of our lives unfurl, we spot another cub playfully run towards the Tigress. She looked content, having her cubs around her. And when we saw her lovingly lick one of her cubs – we held our breath and revelled in the moment. Very soon the arrival of another Jeep unsettled the cubs and they got restless. And the mother decided to move deeper into the lantana. We were a little disappointed as we thought that was it. But the Tigress, after walking about 75 feet inside the lantana, decided to change direction. She came to the edge of the Lantana, drank water from a small puddle, walked to a tree, scent marked it and started crossing the Jeep tracks. The cubs followed suit. Did I say earlier that there were two cubs – imagine our excitement when we see not 2 but 4 cubs about 6-8 months old crossing the jeep tracks, following their mother. It was a breathtaking and emotional wildlife moment for all of us. The Tigress crossed the Jeep tracks and is walking towards the lantana on the other side in this image. EXIF – D300, 300mm f2.8 lens, handheld (beanbag supported), 300mm focal length, f2.8, 1/2000s, ISO200, -0.7EV. The Tigress is staring at us from the edge of the lantana, contemplating whether to cross the Jeep tracks; one Tiger cub is also seen, partially hidden in the tall grass in this image. EXIF – D300, 300mm f2.8 lens, handheld (beanbag supported), 300mm focal length, f2.8, 1/1000s, ISO200, +0.3EV. We were lucky to get a image of a Tiger cub through the distracting lantana using manual focus. EXIF – D300, 300mm f2.8 lens, handheld (beanbag supported), 300mm focal length, f2.8, 1/320s, ISO200, 0EV.Here’s an image of the Tigress along with two cubs walking along the lantana towards us. EXIF – D300, 300mm f2.8 lens, handheld (beanbag supported), 300mm focal length, f2.8, 1/2000s, ISO200, -0.7EV. And in this final collage, you can see the four Tiger cubs crossing the Jeep tracks at about 100 feet from us. EXIF – D80, 18-200mm f3.5-f5.6 VR lens, handheld, 200mm focal length, f5.6, 1/250s, ISO200, 0EV. Pl. take a moment to vote for us and write a testimonial at “The Great Driving Challenge” here. The voting process is in two steps – you visit and vote at the site and then click on the verification mail that comes to your email id to complete the voting process. Thank you for taking the time to vote for us, we appreciate your support…Thomas & Shilpy (T&S;). Pl. click on the camera critters logo to visit more . AMAZING!!! You are so lucky to be able to see these beautiful creatures in the wild like this! yet another series of amazing images. bewitching pictures of the tiger and cubs. splendid work as usual Thomas!!!!!!!! Just amazing…….i'm speechless!!! wow! awesome shots. particularly like the one of the cub behind the grass. These photos are wonderful. Thank you for letting us see what we couldn't otherwise. I'm totally amazed by what you caught on camera..glad it was safe. Pour moi, c'est lui le roi des animaux. I am blown away by these tiger photos. So nicely done. My heart would have been pounding like crazy if I had been there and able to get these shots. are the two of you so incredibly brilliant at finding great wildlife or is it just luck (and tons of it ;-). 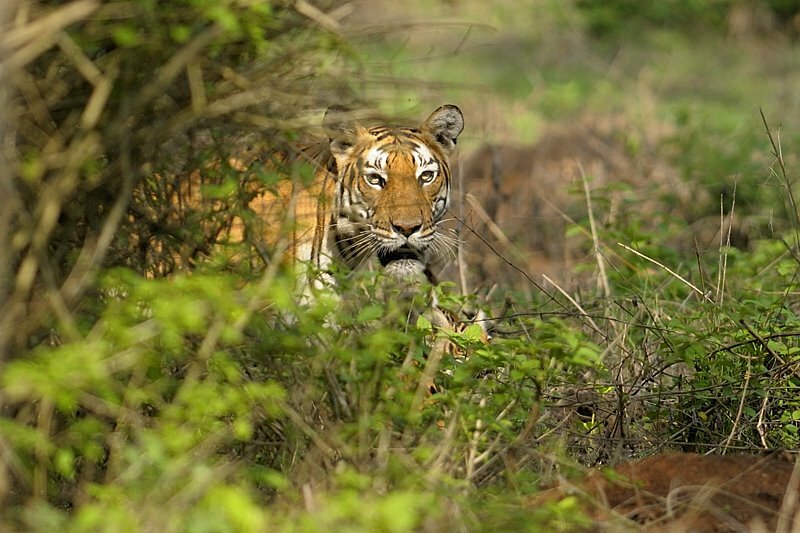 great post and fantastic photography, have not seen tiger in the wild before. great stuff. T & S, you have my vote. Another great great series! I especially like the photograph of the cub through the tall grass. Fantastic as always. My favourite has got to be the third one. What an amazing encounter with a tigress and her cubs! Thanks for sharing your wonderful photos! Otra espectacular coleccion de fotografias de este tigre de bengala, impresionante como van en manada. Beautiful! I love the 3rd shot with the manual focus of the pup in the grasses. Thank you! Absolutely glorious photographs of sucha wonderful subject. Magnificent pictures!My cousin is wonderful! Amazing shots of one of nature's most gorgeous creatures … mom and her babes. Beatiful Tiger and wonderful shots. Another magical moment and full of emotion that you are sharing! Good luck to the Great Driving Challenge. Thomas, if I ask nicely, will you bring me to see tigers? I am mouthing big wows here looking at your pictures! I loveeeeeeee tigers, they are the most beautiful creatures in my eyes! My dream safari! Good luck from me too, on the Great Driving Challenge. Beautiful captures! Very nice colours and very impressive animals! Great work! As usually, you gave us a nice documentary of life around your area!! Gorgeous shots, marvelous text and indeed marvelous observation!!! still digging these stories of your adventures there.. that must be fun to do! aaand.. you got my vote, bro! 😀 good luck!! Amazing shots. Wish you good luck for "Great Diving Challenge"
4 cuibs !!! that's good news ! This is a breathtaking serie ! The cubs are so cuuuuuteeeee…You did a gr8 job again! 🙂 Keep it up and yes all the best for your Challenge..
Great shots…we got similar ones, buy yours are obviously better. Thomas: What an outstanding capture of the Tiger and the cubs. You astound as expected my freind. Wowww… Nice pics of big cats!!! You have done such a terrific job, great pictures that I always admire. Sure, I 'll and have now voted for you. Wildlife moment of a lifetime is right! Thanks so much for sharing it with all of us! I'm glad I clicked on your post from the CC page. Wow, what spectacular photos! What awesome experiences you must be having! Beautiful tones in tigers skin, perfect lighting. Wonderful photos! I particularly like the one of the tiger seem through the ticket of woods. Well done! Oh my God! What a series of photographs! Superb work my friend!! 🙂 Congrats! WOW !!! Amazing series of captures of some magnificent animals !! The cubs are so cute! What an opportunity to photograph mother and offspring. These are fantastic shots of some very exquisite animals. And thanks for visiting my blog and commenting to my contribution Sunset at Frøyas Have this Sky Watch Friday! stunning stuff – this is the animal species top of my most want to see in my life list! Simply amazing imagery! Fantastic shots! So beautiful to see healthy tigers, especially cubs. I pray for their safety and long life. Good luck with the contest! owh man, you really are lucky. Nice spots ! Wish we had such animals down here in the low lands. Amazing shots, so beautiful and impressive work, thank you very much dear Thomas. That light is amazing and shows off the tiger in just a stunning way! So neat to see the little cub peeking through the tall grasses! This a STUNNING post again Thomas. You can see she is heavy with milk to feed those beautiful little cubs. What a pleaseure it always is to visit your blog. I just read that DNA-printing of tiger poop in Bandipur has shown that there is a healthy population in the forests of Bandipur, and your pictures are a visual testimony! I do hope that lovely pictures like this show people the magnificence of this animal and the need to preserve them and their habitat. I pray that my grandchildren and their grandchildren will still be able to see these majestic cats in their habitat. These photo's are stunning. What majestic creatures. You capture them so well. You have captured their majesty! Stunning. Magnificent and powerful! It is good you went back and hung around to get all these wonderful shots! Those photos are absolutely amazing. That's so cool that you can go see them in the wild and get so close to them. Also, that's a crazy awesome zoom you have! Breath-taking! I had to remember to breathe while viewing these spectacular photos, Thomas. How precious you were able to get the shots you wanted. To think there are four additions to the species in the sanctuary. Truly wonderful. Utterly awesome, … magnificent pictures. Excellent work! Tigers and family moving freely in natural environment. These are, again, absolutely marvellous. Quel animal magnifique ! Ce doit être extraordinaire de voir un tigre en liberté. Thomas I have voted for you in "The Great Driving Challenge"
Fantastic series! Beautiful details and DOF. Needless to say, Thomas, the two of you deserve that award and I sure do hope you get it! The things you have seen with your eyes and then have given back to us via your lens is like heaven on earth! Wow! What a fantastic catch. This must have been gorgeous seeing them. When I was in India years ago, we tried to track down tigers for 3 days with no success. Simply incredible animals and the colors are fantastic in these image! These are such beautiful cats! Wonderful work on these! How privileged you must feel to get close enough to these splendid beasts to get such gorgeous images. How privileged I feel to view them! Stunning photography. I wish. But then if I had a tiger in my backyard I would faint first and if I woke up anywhere besides the tiger's stomach, I'd become a saint. Now there's a big cat! I see you used your full range on your zoom lens. Probably a wise decision! Great great shots and how brave you and S are. Am simply impressed with your hobby. And thanks for the compliment on my post though they're just amateuristic, 🙂 and am still waiting for the email for confirmation. Goodluck! A new visit to India, discovering the fantastic wildlife ! Thanks a lot for the trip. Always enjoy it ! I am always amazed by the shots you are able to get! Superb! Stunning images, i will be voting for you! these are such difficult shots to capture, but you did an excellent job capturing the details and tones of this animal. nicely done. Beautiful big cats. I love to hear them purr. Beautiful series as usual, really an amazing encounter! Wow must be so cool to get so close to these amazing animals! Great series! Impressive captures as usual Thomas. Have always been fascinated by the Bengal Tiger and your images of this powerful animal are nothing short of amazing. Excellent compos. did you spot them in the nature or in a zoo? I just voted for you on the contest…good luck with that!! Amazing photos! The cubs are adorable!!! Otra serie preciosa. Muy buen trabajo. Saludos. Absolutely pricelsss photos. I thank you for these beautiful and majestic Tigers for us all to see ! I hope the babies grow up and are safe. The sequence with the cubs is fabulous! Well done. Wow, awesome shots, cute cubs! Just when I think you couldn't get a better post you do..again, and again!! Your blog is a winner..and so deserve my vote!! Love this post..awesome big cats and you caught them in their habitat..not something too many people get to see! Your photos seem to be in movement, it is magnificent! A wonderful opportunity photographed very well! Fine actions shots. I love the color and the sharp detail you were able to capture. The shot with the tiger barely visible was very unusual I thought. Fine work. Another wonderful series! I think all shots are true winners! Great work. 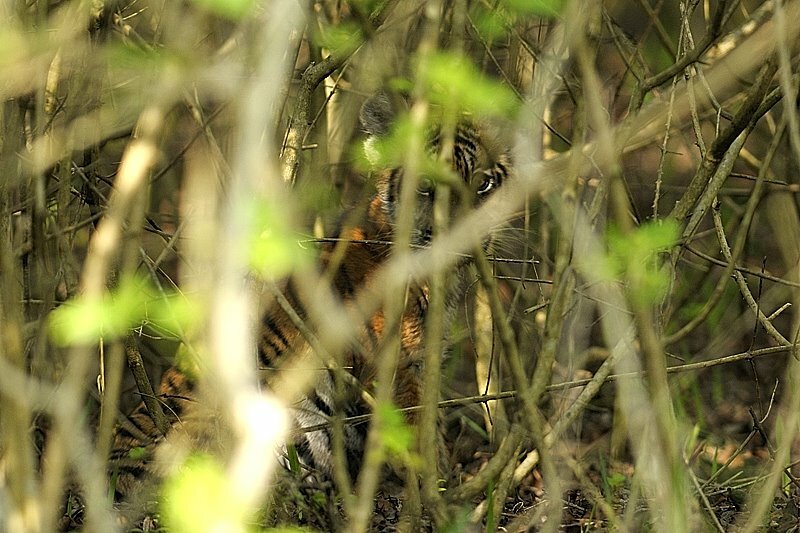 I really felt in love with the one where the tiger is hidden by vegetation, we suddenly discover his eyes looking at us, really great. wow! i would have never thought those big guys were cubs! fantastic. best of luck for the driving challenge! you have captured a really wonderful moment! Breathtaking experience! They are just the most beautiful creatures! okay thomas, you'll get a vote from me because you comment on my blog. i might just get hammered by a certain other couple for that!!! Fantastic series, I like the second one with the partially hidden staring Tigress. Another great series. I really like the third shot peaking through the branches. Very spooky. Thomas, An absolutely amazing encounter and you captured it well. That is one of those experiences than one savors for a lifetime. Amazing photos and so fortunate to capture the cubs. Wonderful detail as usual. Wow, great shots. The mother tiger looks so powerful, and the fact that she has cubs shows her gentle side, great set! You have such a knack to capture breathtaking moments! Just awesome! How very cool! You do get so close in your encounters! Love the cub! wow great post of some tigers. they are so healthy and beautiful. So impressive ! And the tiger cubs are so lovely. 124 comments, and no wonder! A wonderful story and a great set of pictures. It is really encouraging to see and read that these wonderful creatures are surviving and perhaps prospering. 125 comments! Great shots. What a majestic animal. Simply Amazing Moment to capture in the wild! Beautiful site with useful informations.